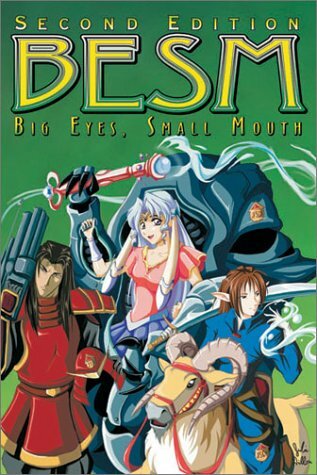 The first edition of this multi-genre Japanese anime role-playing game was nominated for the 1998 Origins Award for Best RPG of the Year by the Academy of Adventure Gaming Arts and Design. This second edition of Big Eyes, Small Mouth (or BESM) is updated in an expanded and full-colour glossy format! BESM is a game for teenagers and adults, inspired by the dynamic settings and stories found in a wide range of popular anime shows now broadcast daily on televisions across America. Comedy or horror, fantasy or science-fiction, mecha action or passionate romance...if you can image it, this book will help you experience it! With stunning artwork and a comprehensive anime resource section, BESM Second Edition is sure to be a hit with role-players and anime fans alike! Pulver, David L.; MacKinnon, Mark C.
Pulver, David L., MacKinnon, Mark C.
4. Big Eyes, Small Mouth (BESM: 2nd Edition) Pulver, David L. and MacKinnon, Mark C.
5. 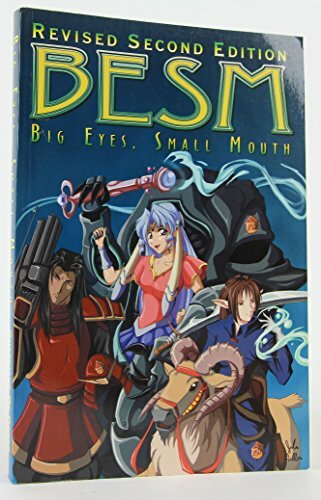 Big Eyes, Small Mouth (BESM: 2nd Edition) Pulver, David L. and MacKinnon, Mark C.